Could Maltese Health Problems Be Causing Dog Eye Stain? Dog eye stain or "tear staining" is one of the biggest problems Maltese owners face. One of the many causes of eye stain can be an underlying health problem. Carefully read through all of the possible health causes of Maltese eye stain. Make sure to clear up any health problems your Maltese already has. This may reduce or even eliminate your dog's tearstaining. What dog eye stain solution worked for your Maltese dog? Tell us about it. The main cause of dog tear stains is wetness around the eyes. This excess moisture is a breeding ground for bacteria and yeast. Red Yeast or Ptyrosporin is what causes the reddish-brown stain. Low grade bacterial infections can also cause Maltese eye stain. Solution - Try to keep your dog's eyes clean by wiping away any wetness. If your dog eye stain problem is not too bad, you can keep ahead of any staining. This is exactly what I do with my Maltese dog Marley. Dogs with heavier tear staining may need another solution. Did you know that as many as 20% of Maltese dogs have blocked tear ducts? Your dog's eye stain may be caused by partly or completely blocked tear ducts which prevent normal tear production. Solution - Visit your local vet and have your dog's eyes checked. Your Maltese may have a clogged tear duct which will need to be irrigated. Some Maltese might even have lower tear ducts that are closed. This often calls for tear duct surgery where they will have to be surgically opened. Many times an ear infection is actually the cause of excessive tearing and staining. 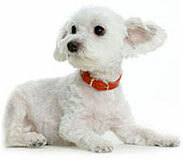 Since Maltese have floppy ears it is easier for them to get a dog ear infection. Solution - Make sure you or your groomer use a good cleansing product that leaves the ears dry after a bath. You can also prevent ear infections by plucking stray hairs in the ears. If your Maltese already has an ear infection, you can try these dog ear infection solutions. If it doesn't clear up quickly, see your local vet and she can prescribe your Maltese some dog antibiotics. Luckily Marley has never had an ear infection and I attribute it to grooming her regularly. Still have questions about dog eye stain? I've teamed up with a group of expert dog vets to help you find the answer.